M Marine ( Mansfield Marine) Inflatables ( like Zodiac, Avon, AB, Brig, Quicksilver): Quality Inflatables of all tender sizes ( from 2.4 to 3.0 mtrs) at a fraction of the big brand prices. Assorted models in Fibreglass and Aluminium V bottom Roll up and RIB's with double bottom and anchor locker or blow-up Airfloor or sectional aluminium panel floor. We have supplied more than 180 NEW M Marine inflatables over the past 5 years without any faulty returns. NOTE: THIS ADVERTISED PRICE IS FOR THE 2.4mtr AIR DECK.... OUTBOARD MOTORS ARE NOT INCLUDED IN THE QUOTED PRICES HERE. WE CAN SUPPLY OUTBOARDS AT ADDITIONAL COST. At Mansfield Marine we pride ourselves on the supply quality boats and quality sevice. Our range of RIB boats are built to a high quality and design standard that we are very happy to stand behind. The RIB hull designs are double skinned and have a fine entry with lifting strakes for stability whilst maintaining a soft ride. The GRP models have a moulded internal flat floor design, with a gutter system that keeps the floor area as dry as possible. All the GRP RIBS have a 4 x internal st steel u-bolts so that a lifting bridle can be fitted to lift with a davit. They also have 3 x external tie down points so you can tie the boat down to a cradle. The moulded lock up fwd locker is great for your anchor or valuables if leaving on the beach, with st steel catch and hinges and a rubber seal. This locker functions well as a step when getting in and out over the bow. Aluminium RIB boats have anchor lockers, Tie down lugs and lifting points installed. All our boats have strap handles, instead or ropes dangling around, have a one way bung with rubber stopper, internal bungs to fwd locker and floor chamber, and we have storage locations for the oars down low out of the way when the boat is being used with an outboard. They all have towing eyes and come with a aluminium seat, pump, repair kit and the roll up boats come with a storage bag. 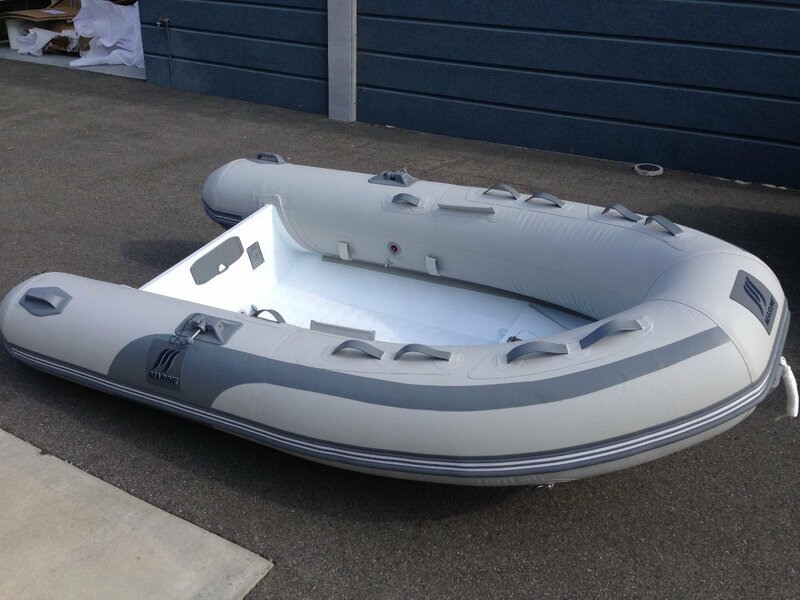 We recommend that all inflatable boats be kept with a protective storage cover on them if stored in the sun. We can arrange for a custom cover to be fitted to your boat. Our 2.4mtr models have the largest diameter tubes we have seen. Stable, dry and strong. The larger tubes also helps save you from a wet bum when the breeze is in. Plate hull (qulaity powder coated) with double bottom V hull and flat floor, anchor locker, davit lifting points and cradle tie down points. Comes with pump, oars, repair kit and aluminium seat. Quality built and stylish tenders. Mansfield Marine have designed these boats to suit the general use of WA boaties. . The boats are built well and come with a 2 year warranty on the fabric and hulls. (Warranty does not cover Sun damage to fabric) Mansfield Marine pride ourselves in providing good quality products and services. We have worked with the manufacturers for a considerable amount of time, making sure that we get the design and quality to a standard that we are happy with. NOTE: During normal private occasional use a PVC fabric dinghy should last 10 years if covered from the sun whilst stored outside. Warranty does not cover sun damage. It is recommended that all inflatable boats are kept with a cover on when stored outdoors. This is the case for any brand of inflatable boat, but more so with PVC boats.